Last Friday, our Council joined thousands of pro-life supporters from across the country in the nation’s capital for the 46th Annual March For Life, a peaceful march for the rights of the unborn. I personally found it to be an inspiring, hopeful event that sent a powerful message to our leaders on Capitol Hill that we are all, “Unique From Day One”, the theme for this year’s march. The Knights of Columbus had a leading presence at the event, which included a speech by our Supreme Knight, Carl Anderson, as well as a surprise appearance and speech by the Vice President, Mike Pence, and his wife, Karen. To get a feel for the size of the event, click here to watch the Students For Life time lapse video of the march. 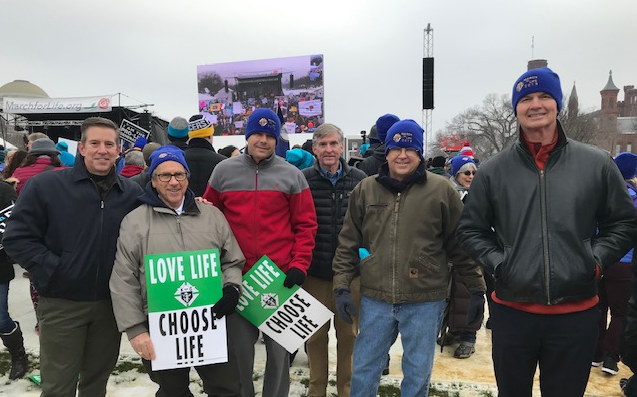 I’d like to recognize the Brothers from our Council – not all of whom are in the picture below – who braved the cold, damp weather to March For Life and provide a voice for the voiceless. Yesterday, hundreds of thousands stood up for the life in Washington, D.C. at the 46th annual March for Life. This amazing event featured speakers such as Vice President Mike Pence, Second Lady Karen Pence, Ben Shapiro, Abby Johnson, Lila Rose, Dr. Alveda King, and many more! Not only that, but hundreds of thousands of participants braved the freezing-cold weather to show our country that human life begins at conception and abortion should never be an option. The video below will give you an idea of how many people attended and literally “marched” for life!